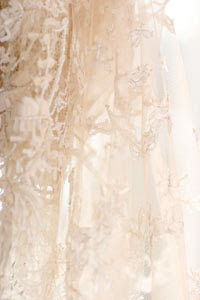 Amazing Tuts: The Wedding Gown – Preserve it or Trash it? It’s nearly 15 years since my wedding and I have taken the extraordinary step of preserving the gown now! It’s extraordinary because I have been outrageously slack and had this gorgeous couture gown – the most expensive and stunning outfit I ever owned – just hanging there in the back of the closet in it’s broken garment bag. (zip broke!). I finally felt really bad about this state of affairs. How could I do this to such a prized & precious possession? A warning if you have just got married – this could happen to you. Once the day’s all over you might get lazy and apathetic about this frock that was the obsessive focus of your world for months!! The warning that I give you is this. If you have spilled (like me) just the tiniest bit of champagne on a cream or white gown then it will caramelise on the fabric leaving an awful DARK YELLOW STAIN!! You won’t know until you pull it out years later and you’ll be very disappointed in yourself for being so careless. My sad experience illustrates negligence leads to extra dollars being outlaid. I found I just couldn’t live with a spoiled wedding dress - too tragic - and it prompted me to have it properly preserved and stored. (14 years and 4 months later.) Of course as the very nice team at The Wedding Gown Specialists told me, had I been smart and done this earlier it wouldn’t be nearly such a drama to remove the mess accumulated on the sumptuous lace and silk chiffon. So serious advice for the just married – get the gown all cleaned and put away properly in a nice box if you want to maintain the garment in good condition and you don’t want it to cost you a bomb later. On the other hand another option is to trash it! Like my Mum, dye it black, chop it off and turn it into a cocktail dress. (She is sooo unsentimental and I am the opposite!) Funnily enough the gown preservers even suggested that to me, as it would have hidden the stain. I guess this way you may wear it again. 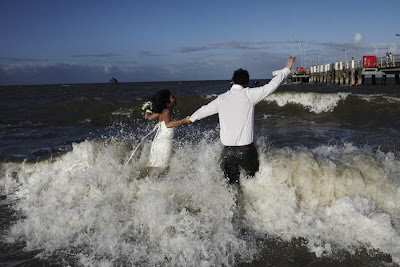 Another trend in the US I just discovered is called “Trash The Dress”. Girls are doing funky post –wedding photo shoots in their wedding dress, accessorised with wild colours and chunky jewellery. Not sure about that but each to their own!